Kinder 2019 — RB Anderson Ltd.
Axel had his skis tuned and waxed for the event. Beckett was back and I think the toe he got caught in the door at the pool was causing some boot “issues”. Riddley and Olivia missing today. Elyse pointed out that there was “little snow flakes” in the air. Who’d have guessed that by the end of the day there was about 20cm of accumulation! We were out the door shortly after my 9:00am alarm sounded. I’m getting a complex… all wanted to ride up with a “responsible adult”. Skis on, it was a blustery ride up Red but nary a complaint when we regrouped at the top. Out of the wind at the light board, I had the kids struggle to hold poles with gloves properly through the straps. That’s still a tough one! Fresh snow in Jolly Green Giant was fun. Kids ducked in and out of the trees on the left. We stopped at a good spot and reviewed tree wells then all practiced on one ski on the road to Emerald. Offloading the chair, I did get a giggle of the snow covered children waiting at the “Whistler Kids Meet Here” sign. Keeping an athletic stance, into the deeper snow parallel to the Terrain Park we went, followed by the bumps on Cougar Trail to the School Yard. Good job all… no splats. Alice told us our groups were racing at 11:15… so we skied beside the course studying the lanes set up. Back up Emerald, we had blizzard conditions blowing us into Roundhouse Roll. Maleah made one turn, fell, and slid to the bottom on her backside (laughing all the way). Side slipping in the deeper snow was a bit of a challenge on Upper Whiskey Jack but those “Big-S” turns were easier. We ducked into the Chickpea for a bit of a warmup with Sigrid and Elyse’s groups. To the race course, I made the kids skate and ski as fast as they could to get ready for the last in our Triple Challenge events against Village Kinder kids. The kids performed well on the course. Ironically, Axel raced Axel from the village! My fingers froze shooting the video… :( We’ll get the results next week. Back up Emerald, we made another foray into Roundhouse Roll with much better results. Little legs had to work harder to skate the snowy flats to Dave Murray. Good turns in the Toilet Bowl and through the fog we parked our skis at Raven’s Nest… and were 15 minutes late for lunch! Maleah could have built a snowman with what was packed in her hoody! Beckett and Brooklyn correctly guessed swamp water today was orange juice and lemonade. Back out we had quite the hunt to find our skis. Luckily, I planted my poles to mark the spot. Axel’s dad joined us on the race to the beaver bench. We then skied some untracked snow down Crabapple to the village. 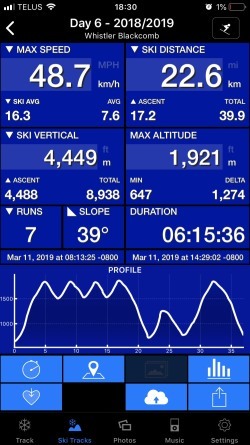 My excitement for fresh snow got the better of me… on the ride up I saw the time was 2:29 and we were only at mid station. Yikes!! I called Scotty to let him know we were going to be late. The gondola must have been perversely aware of the situation then slowed to a crawl and stopped several times. Axel’s dad signed him and Beckett out at the Olympic rings. Wearing two extra FLAIKs and vests lopped through my belt we were off at a brisk pace down Pony Trail to the Orange Peel flats. Axel and Beckett came flying out of the trees at the end of Fruity Trees. Finley thought we might be doing Wild Card and didn’t want to give a primal scream in the tunnel today. However, I am impressed with all the kids stamina. They wanted to do the jump and chicane behind the Tree Fort. 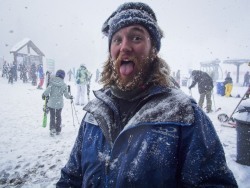 We skied pretty much non-stop through Bear Cub back to Creekside gondola…. … 45 minutes late. I hang my head. Next week is our “Final Assessment Day”: Who improved the most and who had the most fun?